Piero Orlandi, the brother of Emanuela Orlandi, joins demonstrators Sunday in St. Peter's Square. Rome (CNN) - The brother of an Italian girl missing for nearly 30 years urged the Vatican to investigate her case as several hundred demonstrators carrying pictures of her marched to St. Peter's Square on Sunday. 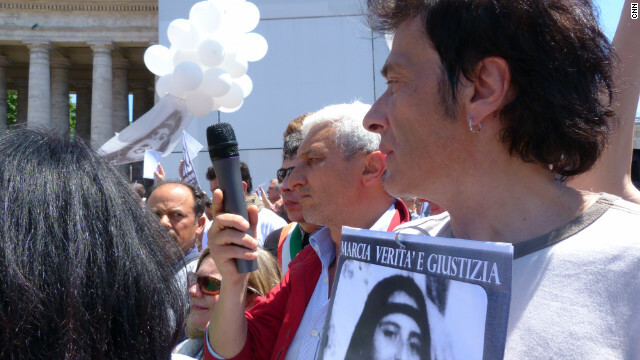 The march came a day after Italian prosecutor Giancarlo Capaldo told CNN that a priest who used to run a church in Rome is under investigation on suspicion of complicity in the abduction of Emanuela Orlandi. Msgr. Piero Vergari, the former rector of Sant'Apollinare, is being investigated along with four members of a criminal gang, Capaldo said Saturday. Vergari, who left the position in 1991, did not reply to an e-mail from CNN seeking comment. "We want the Vatican to open a serious investigation into the case," said Piero Orlandi, the missing girl's brother. Sunday's march is the latest attempt to get to the bottom of one of Rome's most enduring mysteries, the disappearance of Emanuela Orlandi, the daughter of a Vatican employee. (CNN)–The showdown between the Vatican and America's largest group of Catholic nuns is expected to peak this week when group leaders will meet to determine a response to the Vatican's reprimand for the group's "radical feminist themes." The church also demands major reforms from the nuns' group. The Leadership Conference of Women Religious, initially surprised by the Vatican's report last month, "plans to move slowly, not rushing to judgment" when the group's 21-member board meets for three days in Washington, D.C., beginning Tuesday. "The board will conduct its meeting in an atmosphere of prayer, contemplation and dialogue and will develop a plan to involve LCWR membership in similar processes," the group said in a statement. "We will engage in dialogue where possible and be open to the movement of the Holy Spirit. We ask your prayer for us and for the Church in this critical time."